Mindi Rochelle Scott lives near Seattle, Washington, USA with her drummer husband in a house with a non-sound-proof basement. 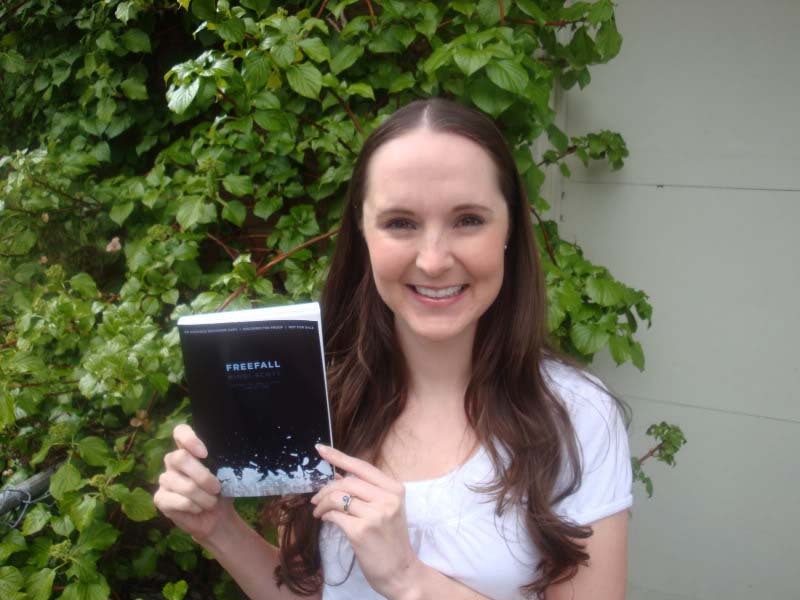 Freefall, her first novel, was published by Simon Pulse in 2010. Her second novel, Live Through This, was published (also by Simon Pulse) in 2012. She contributed a chapter to Violent Ends, a collaborative novel written by 17 young adult authors (out in 2015), and co-wrote, along with Michelle Andreani, the 2016 novel The Way Back to You. 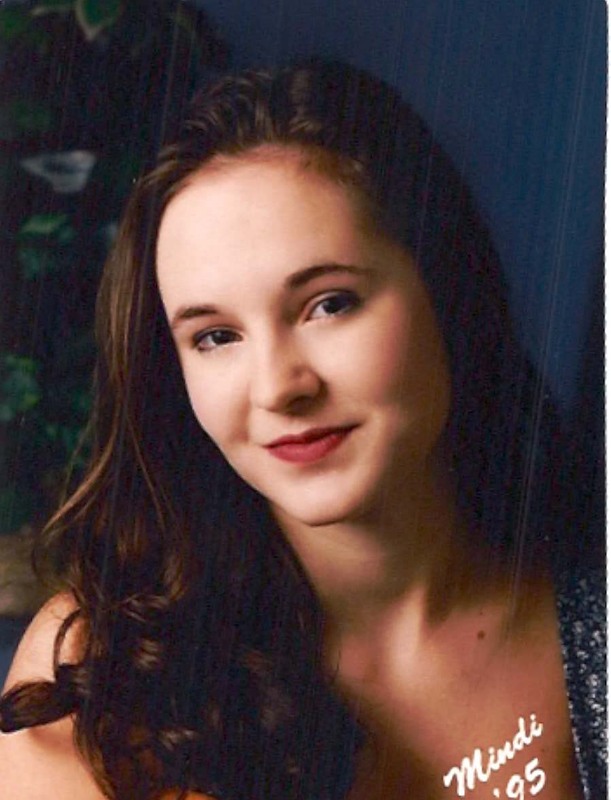 She is represented by Jim McCarthy of Dystel & Goderich. I was born in 1977. What followed has been a life devoted, in large part, to reading, writing, and . . . cats! Before I was able to read on my own, I was always looking through books and making my parents and grandparents read to me. I also had my own record player, and since some of my storybooks came with records that narrated, I’d listen while looking at the pictures and waiting for the chime to turn the pages. From that moment on, I was unstoppable. Growing up, I spent a lot of time at the public library. I’d check out the maximum number of books allowed and finish them in a matter of days, ready for a new batch. 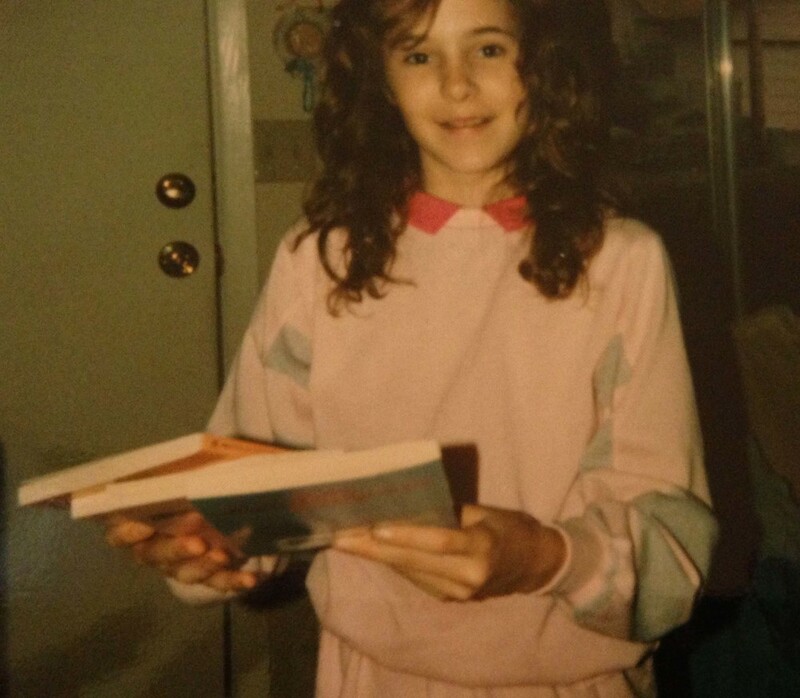 Beginning in about fourth grade, I got very involved in reading series shelved in the Young Adult section such as Nancy Drew, The Baby-Sitters Club, Sweet Valley High, Cynthia Voigt’s Tillerman Cycle, and everything by Judy Blume. I chose to spend my free class period in eighth grade helping my school librarian. The following summer, I read my first non-Young Adult novel, which was a “historical romantic suspense” called The Captive by Victoria Holt. 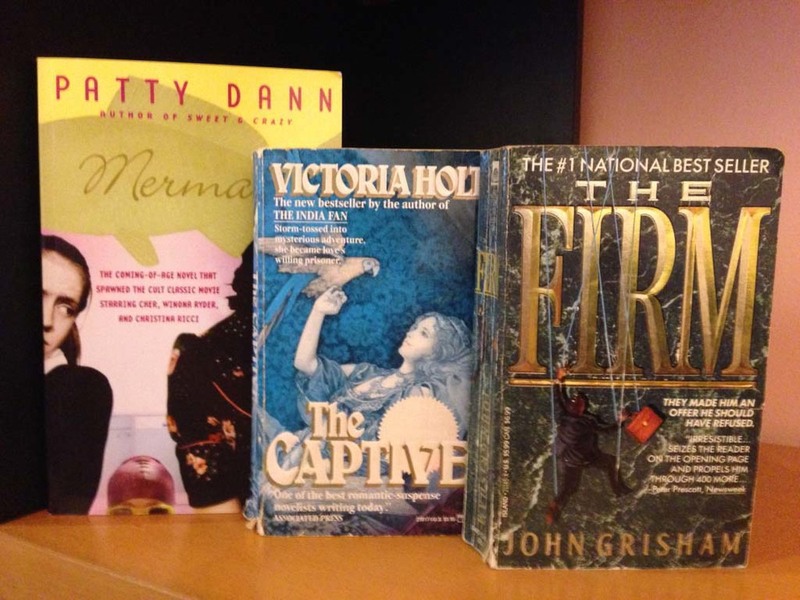 That same year, I read a few John Grisham novels and Patty Dann’s Mermaids—which is still one of my favorites. 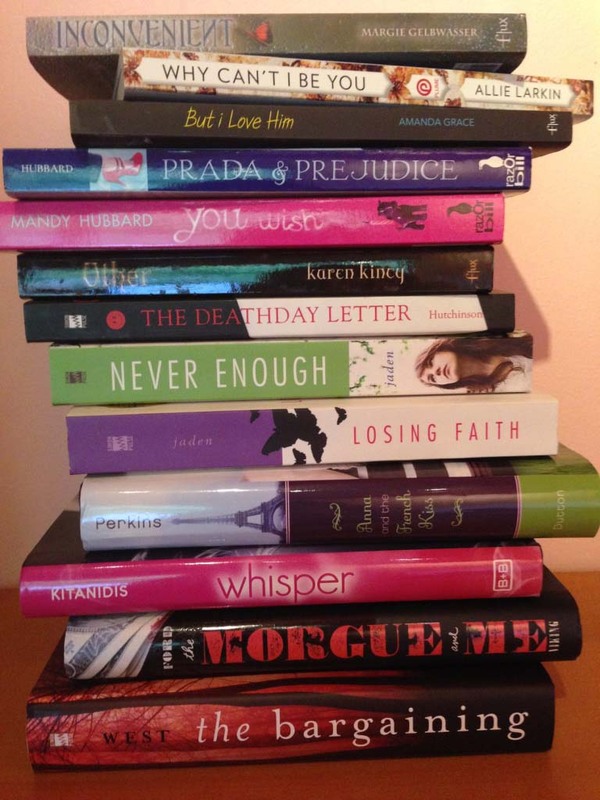 I decided that at age thirteen, I was probably too old to keep reading about teenagers. 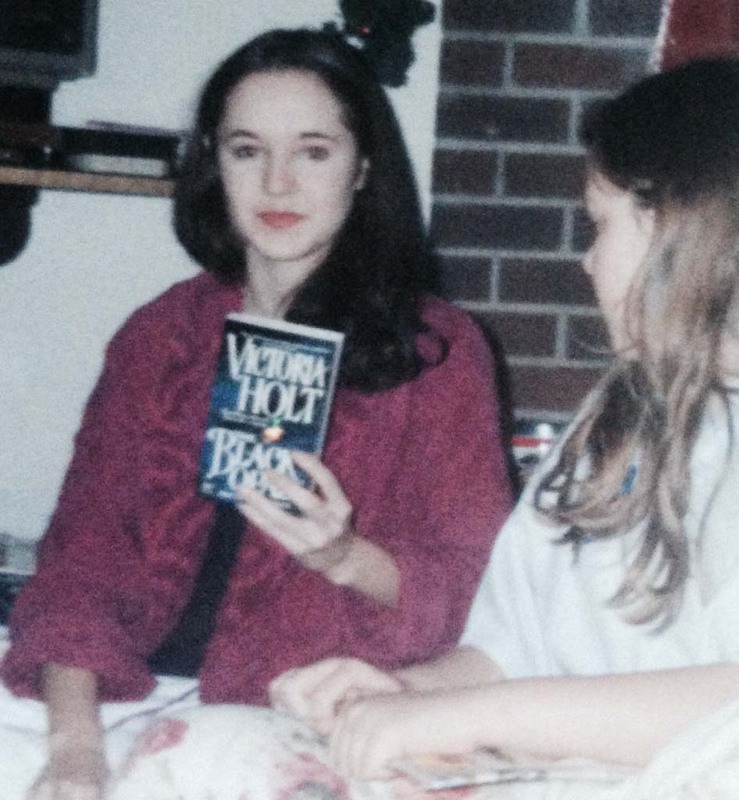 During high school, it became clear that my uncontrollable reading habit was kind of a problem. Once I started a book, I’d rather spend all my waking hours finishing instead of doing anything else—including my homework. Since I am such a binge reader, I had to start forgoing reading for pleasure except during weekends and extended breaks. After graduating from high school and starting college, my first job in the real world was at a bookstore. Here I could read anything I wanted, and often opted for celebrity biographies and the classic literature that I hadn’t gotten around to reading in high school. At the start of my twenties, I dipped my toes into reading fantasy with books by Melanie Rawn, Robert Jordan, and J.K. Rowling. I also read a lot of Terry McMillan, Rosamunde Pilcher, Ann Rivers Siddons, and Amy Tan. I was very pleased when, ten years after reading The Captive for the first time, I had finally collected a used copy of every title written under the Victoria Holt and Philippa Carr pseudonyms. 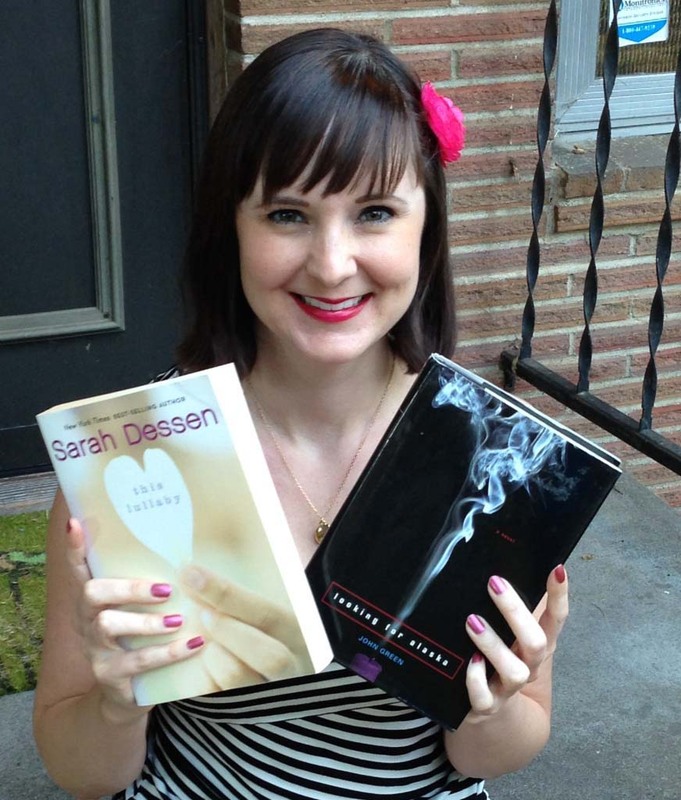 In my mid-twenties, I decided I wanted to try writing novels instead of just reading them. I spent one summer reading over 100 books in various genres to decide what to focus on. This experiment led me back to Young Adult fiction for the first time since I became a teenager. I fell in love with YA—particularly the contemporary realistic ones—and now, over ten years later, the majority of what I read still falls into this category. 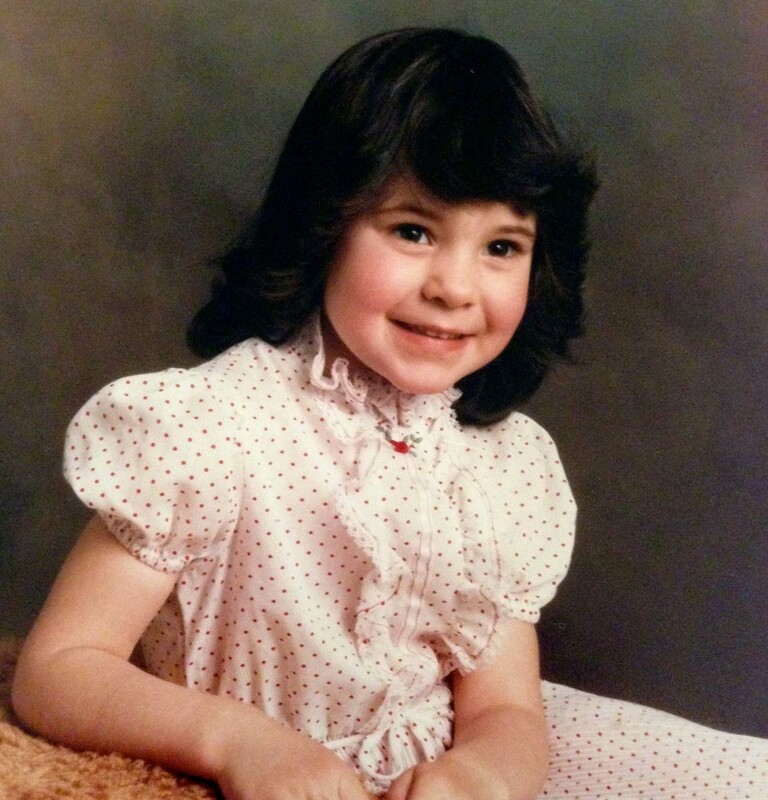 I guess I've always been a writer, too--it just took me a while to figure out. When I was seven years old, my grandma gave me The Book About Me and My Fun Times, which is a keepsake where I was able to fill in the blanks and create my first biography of sorts. Most of my responses to the prompts weren’t very creative, but it amuses me that I scribbled out which movie star I wanted to pretend to be and wrote in that I’d be a cat instead. To my utter humiliation, when I was ten, I was chosen as my school’s winner for the George Washington poetry contest. I had to read my poem aloud in front of my class, and the memory still makes me tear up to this day. The only cool thing about the experience was that I got to visit the local newspaper office where they took a photo of me to be published in the Sunday paper along with my wretched poem. (I don’t know why this old newspaper clipping looks like it was part of a murder scene. Oh, and no, I am not sharing the poem. Not ever!) This experience made me decide I never wanted to be a poet, but maybe I’d like to work at a newspaper. At the end of fifth grade, I was assigned to write my own book! 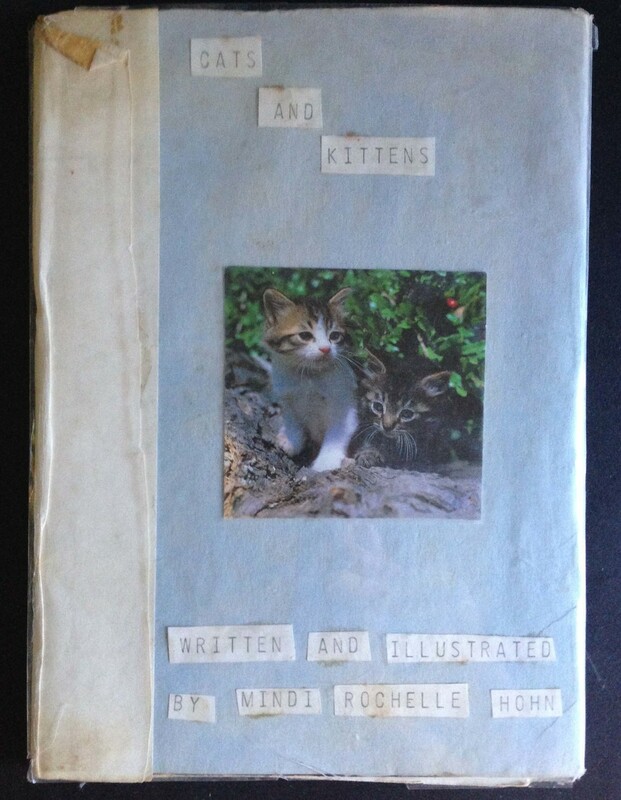 I helped one of my friends write a short novel about a cute boy who kept showing up and smiling mysteriously at her, but for my own, I chose my favorite topic of all: “Cats and Kittens.” On the cover, I made the claim that I’d written and illustrated it, but it was all (unintentional) lies! I thought rearranging sentences from my source material was the same thing as putting it into my own words. I also thought cutting out pictures of cats and gluing them into my book was the same thing as illustrating it. I got an “A” on the project, but I think it was mostly because of the tremendous amount of work I put into hand sewing my own book binding and typing up the text. I started keeping journals to document my day-to-day life (and I continued even after I’d graduated from high school). From Anne Frank: The Diary of a Young Girl, I got the idea to name my journals so I could pretend I was writing to an imaginary friend. Unlike Anne Frank, I acknowledged that Carnation, Rainbow, and Tulip were books by asking questions within my entries about whether they’d had a good day sitting on my nightstand all day. It was all very meta and strange, and you can read from some of these journals. I destroyed my 6th and 7th grade diaries when I was in 7th grade, because I was paranoid that someone would find them and publish all my most embarrassing thoughts. I later got over that fear, so I still have my other diaries. In 8th grade, all I wanted was to be on the yearbook staff, which was the closest thing that we had to a newspaper. At my school, students had to apply to work on yearbook and only a select few were chosen. I didn’t make the cut, so I played volleyball instead, and heck yes, I ended up winning a much-deserved trophy for “Most Improved” player. Take that, yearbook! At the start of high school, I decided that what I wanted most in life wasn’t to be on yearbook, work for a newspaper, or write books; I wanted to become an actor and marry Christian Slater! My school was small and didn’t have a drama class, but it did have yearbook as part of the curriculum, so I ended up working on the yearbook in 9th grade after all. Then in 10th grade, I was selected for yearbook editor. (Did I mention that it was a very small school?) I turned down the position at first because I was already the ASB vice-president and I didn’t like the idea of having so much responsibility. I did accept the assistant editor position. Then the girl who was supposed to be editor switched to another school partway through the year, and I ended up as yearbook editor by default. Thirteen-year-old me would have been so pleased, but fifteen-year-old me thought it was a burden. My family moved the summer before 11th grade, so I started at a new high school in the fall. But then, I’d given up on acting and Christian Slater, and had decided I wanted to be an accountant. I took all of the business electives my school offered and wasn’t interested in yearbook or journalism because those were no longer relevant to my career goals. But once I’d graduated from high school, I wasn’t excited about accounting anymore and started college with the goal of becoming a dental hygienist. There was a lot of science and math required, which I don’t excel in, so I gave up on that plan partway into my second year of prerequisites. I continued with college and took creative writing classes with the idea that I might write a novel some day when I was really old. While I was still in college and working at the bookstore, Dwayne, one of my coworkers, agreed to critique my papers. He said he liked the honesty in my writing and wanted me to show him more. On a whim, I brought in Carnation, Rainbow, and Tulip, my high school journals, which I’d never showed to anyone. He read them cover to cover in two days, and after we’d started dating a few months later, he admitted that he’d fallen in love with me while reading my journals—not because of what I was like as a teen, but because I was willing to share so much of who I was with him. And so five years after we met and two-and-a-half years after we became a couple, I married the biggest fan of my writing that I’m ever likely to have. 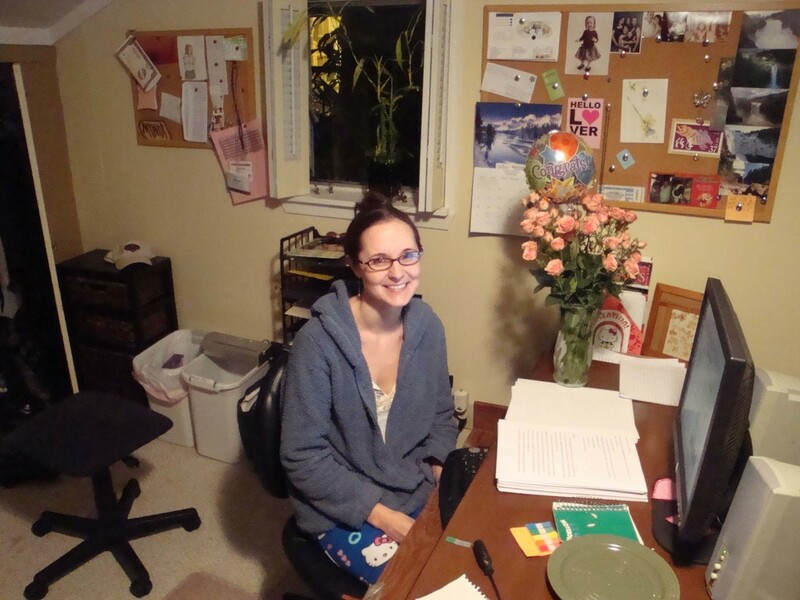 In my mid-twenties, I wasn’t happy at my office job, so my husband suggested I try to make a living from my writing. I did just enough research to know it was going to be challenging, but not enough to know the truth about exactly how challenging. My first step was reading over 100 books that summer to figure out what I wanted to write. Then I took a nine-month fiction-writing program at the University of Washington. At the end of it, I had a completed draft of my first young adult novel, Faded As My Jeans. I sent out queries to agents, and collected about 75 rejections in a nine-month span before deciding to move on. After a few false starts with other manuscripts, I enrolled in a MediaBistro Young Adult Novel writing class and began a new project. This project was originally titled The Fake McCoy, later became Scratching at the 8-Ball, and later still the real book known as Freefall. I spent 18 months writing and revising it for 20 to 50 hours a week. This time when it was ready, I sent it to agents with the hope that I’d get representation in my first or second round of queries. Instead, after another nine months and 75 rejections (what are the odds of that happening twice?) I felt defeated, like I’d wasted my time, like this writing-to-get-published venture might not be worth all the pain. I decided to do one more revision in December 2008 and sent out more queries. It was my last shot with this manuscript before I would put it away forever. To my surprise and amazement, Jim McCarthy offered representation January 6, 2009 (the day after requesting and receiving it) and sold the book to Simon Pulse that May. Freefall was released in October 2010! Since then, Live Through This, was published in 2012; Violent Ends--a collaborative anthology--was released in 2015; and The Way Back to You, which I co-wrote with my friend Michelle Andreani (whom I met in that Media Bistro class when I was learning how to be a writer), came out in 2016. I have always loved cats. 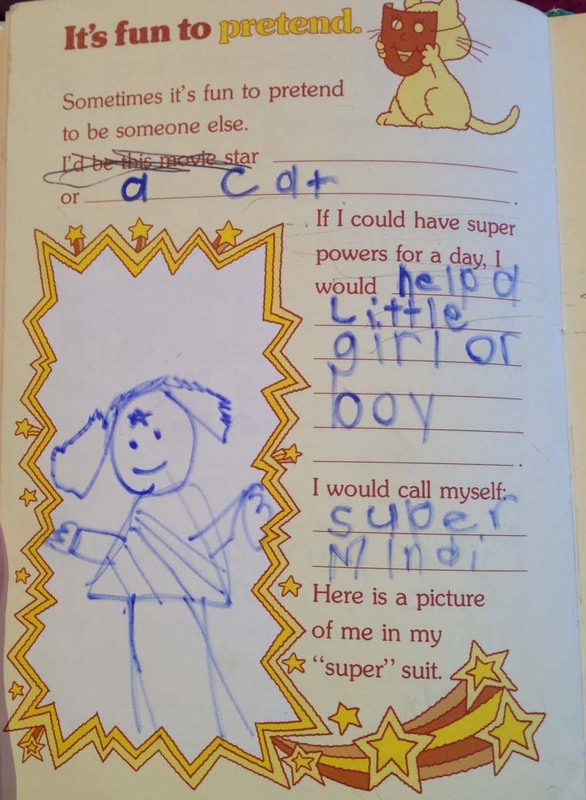 When I was four-and-a-half months old, my mom wrote this note in my baby book: “Mindi just loves her kitty cat, Natasha. She tries to touch the kitty while she’s in her baby walker. The cat keeps her busy while I’m fixing dinner in the kitchen.” So, basically, my first best friend was a calico cat, which set me on a lifelong path of being a cat lover. 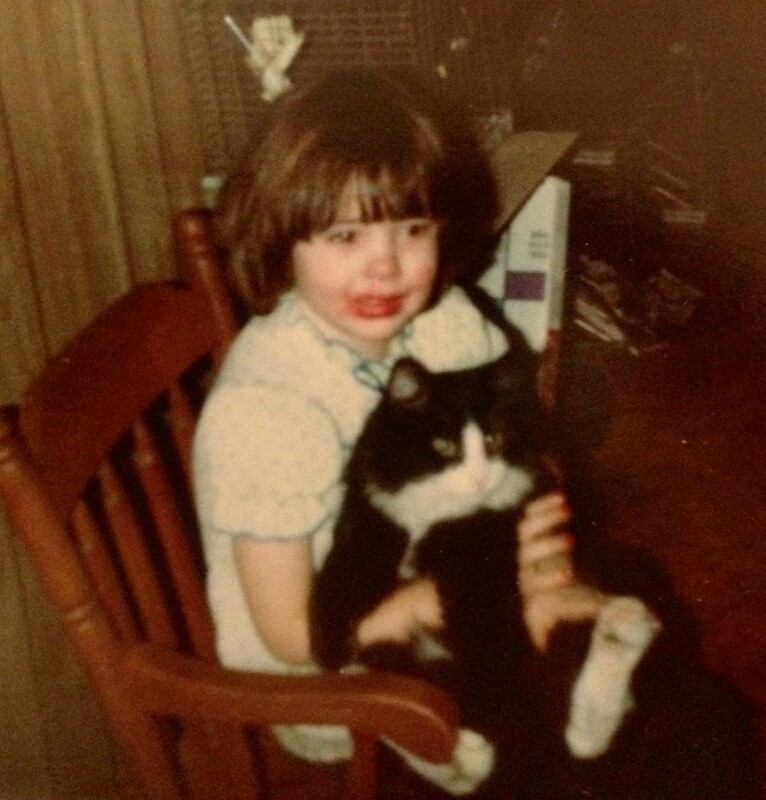 The book I co-wrote with Michelle Andreani, The Way Back to You, features an all-black kitten named “Arm.” Only weeks before we turned in our final draft in 2015, I was stunned to come across this picture of Meow Meow and me. 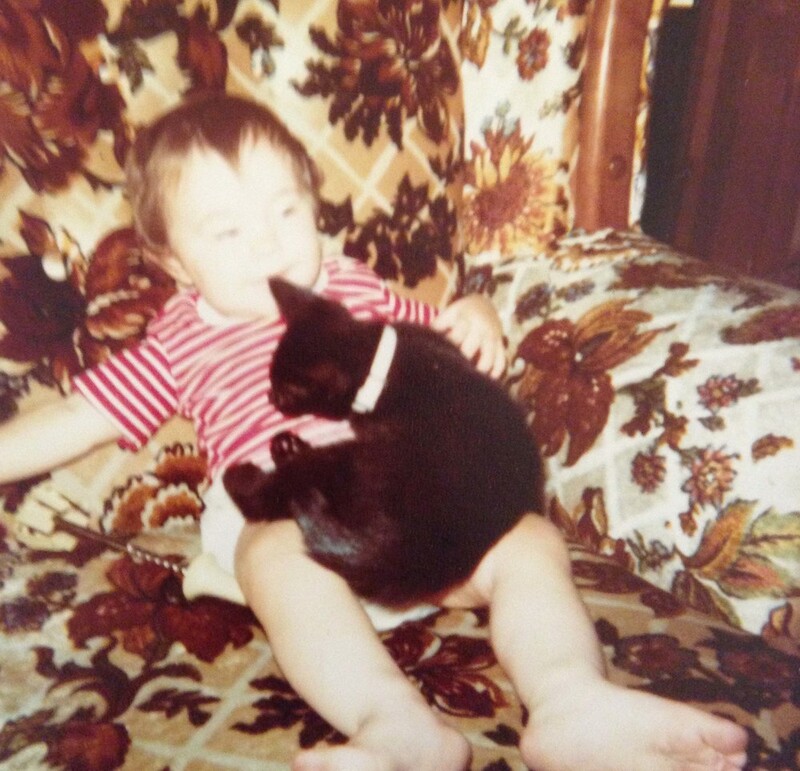 I’d had no recollection of living with my own Arm kitty as a baby! Alexis (Lexy) was a patient and kind feline, and a great fashion accessory, along with my expertly applied red lipstick and red nail polish. I’d read her stories and dress her up in my doll’s clothes. She seemed . . . kind of okay with it? 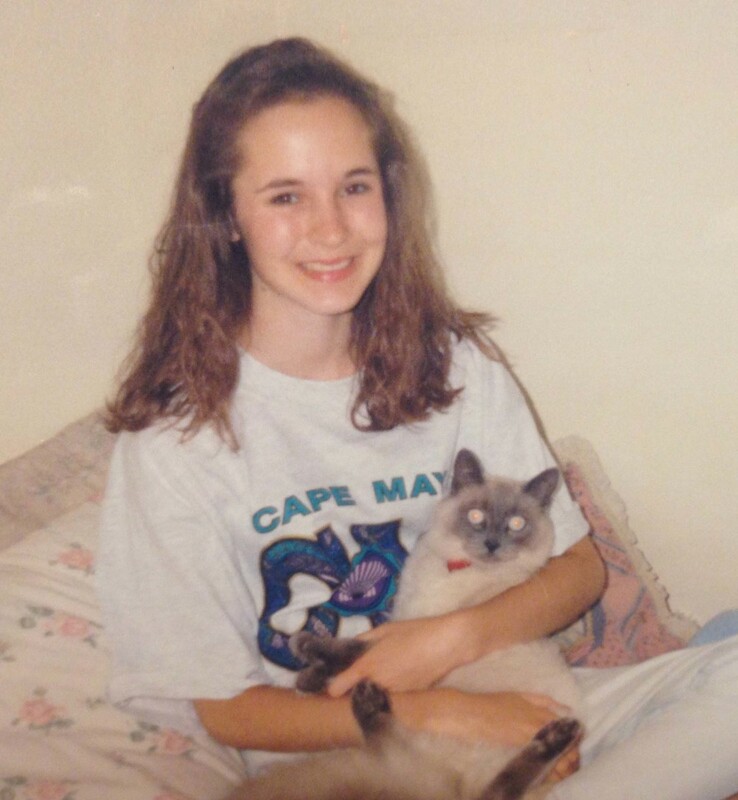 A character that appears in Freefall as the girl Seth had been “pretty into last year” and in Live Through This as a member of the dance team, was originally named after my family’s cat Alicia (Chelsa). But since I already had a character whose name started with “A” in Freefall, I changed that character’s name to Felicia instead. Rochelle (Shelly) was my very sweet black-and-white cat, who would lie beside me in bed while I was up late reading. Nicole (Coley), was my younger sister’s striped cat. The protagonist in Live Through This is named Nicole and goes by “Coley." Oliver was my mom’s cat, but he’d occasionally hang out with me. (We didn’t name him for the Disney movie; the Humane Society told us he was a girl, so his name was Olivia for the first few weeks.) The love interest in Live Through This is named Reece Oliver Kinsey. Neko is the name my husband and I gave to a pregnant stray that turned up in our lives when we were in our mid-twenties. She and her kittens (Oz, Niña, and Angelus) ended up moving in with us. I later used “Neko” as one of my protagonist’s names in an unfinished/abandoned manuscript. Oz (Silky) was a big, strong cat, but he was also very sick for the last few years of his life. It took a huge toll on me when we finally had to have the vet put him to sleep to end his pain. Some of the emotions and thoughts my protagonist, Kyle, experiences in The Way Back to You were inspired by my own after Oz’s death. While still working on that book, two of my family members passed away, and everything I went through after Oz and while writing Kyle helped me cope. Niña’s voice when she meows is much growlier than you’d expect, and was the inspiration for Arm’s voice in The Way Back to You. Niña “shows affection” by gnawing on my wrist bones, which is why Matty’s cat in that same book, Hercules, has this habit. Angelus has big-time anxiety. As a kitten, he once climbed onto the roof, panicked, and then jumped down the chimney. Hours later, we finally found and freed his soot-covered self. Matty, in The Way Back to You, tells a story about Hercules having done exactly this as a kitten.